A problem of programming MHT converter is easily solvable after you download Total HTML ConverterX. This is a functional MHT to RTF SDK tool that features efficient, fully adjustable converter that can be easily integrated into your code. 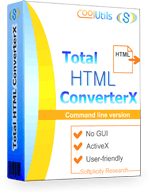 Total HTML ConverterX is an SDK version of desktop Total HMTL Converter. Use its code for implementing MHT RTF converter into your own projects. Selective content conversion means that you can render only text or only images from MHT originals. The program can export web pages to RTF with initial formatting too or apply the parameters user specifies manually. Numerous convert MHT to RTF command line parameters allow fully customizable conversion. If you are using Total HTML ConverterX as SDK for programming your own converting utilities, you can pick the features you need and port them to your own code. For converting MHT to RTF no GUI is provided. However you can integrate conversion code into any user interface you wish. Total HTML ConverterX can be ported into other applications with the use of ActiveX. Programmers will find a lot of advantages of using this SDK for developing their own converters on different languages. Here you can find code samples for developing MHT to RTF C# converters. Based on these samples you will need to make minor adjustments to make your own app fully working. Download free trial SDK here for quick test. It is easy for use and extremely functional!